NRichieNews and The Trend Boutique have teamed up to give one lucky reader the chance to win a statement piece of jewellery from House Of Harlow 1960. To enter the competition it is as easy as 1-2-3! 2. 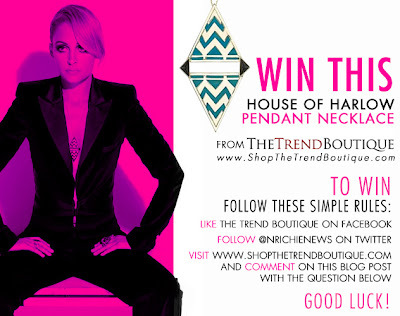 FOLLOW @NRichieNews on Twitter and also Tweet " I have entered for my chance to win a House Of Harlow 1960 necklace from @nrichienews http://bit.ly/i6LiNe "
3. Visit ShopTheTrendBoutique.Com and find the perfect item of clothing that you would pair with the House Of Harlow 1960 triangle necklace and comment on this blog post with your answer! This competition runs from 13th March - 21st March, Entrants after this date will not be counted. In this blog comment you must include your Twitter name and also Facebook name so I can see that you have Liked The Trend Boutique on Facebook and are also following NRichieNews on Twitter. I will also use one of these platforms to notify you if you win. It is open worldwide, so all entrants welcome! I would wear the Winter Kate Damien Dress in Ivory http://www.shopthetrendboutique.com/wikahojainiv.html !! I would wear it with the Rachel Pally Ariel Dress in Sailboat. Ive never won one of these!!! Let's see what happens!!! Love Nicole and WK and HOH! Yay! I would wear this necklace with this Jen's Pirate Booty mini dress!!!! I'd pair it with this Bailey 44 flamingo colored tank because those colors would be smashing together! Perfect for Spring! I would pair the HOH necklace with this black dress by Lauren Conrad because the turquoise colour stand out, and it's black edges would match the dress. so many options.. dare to be different i would wear this with..
dare to be different pops of color.. I would pair it with the Winter Kate Isolde Dress in Ivory. Love everything Nicole Richie, WK and HOH! I would wear this with the LnA Pullover Cape Tee in Black! sorry for the double post, i forgot to inclu my id's. please delete my first entry. i chose the wear the Winter Kate Condor Bed Jacket in Mint with the necklace, both gorgeous pieces! I would pair the amazing House of Harlow 1960 necklace with the Jen's Pirate Booty Senorita Tunic in White! I feel that this off the shoulder look would make the necklace pop and would pair perfectly with the vibe of the jewelry! Love the necklace! Thanks for offering this giveaway! Fo me, the perfet item i would pair with this HOH 1960 triangle necklace is the jen's pirate booty goddess long dress in white from the Trend Boutique. This look is the perfect classical bohemian style. My next purchase for sure! That's sad... I boycott Facebook, so I can't enter to win. This is probably the price. But please don't restrict it to certain networks when you do another competition in the future. Thanks alot anyway for making a competition to win such a beautiful piece. I have chosen this dress from Daftbird. It's a very casual dress, but if you pair it up with this Pendant Neckless from HoH 1960, it looks a little less casual. I would pair it with the Winter Kate Kimono Dress Floral, my favourite! The necklace would give a touch of colour in a hippie style! I would pair it with the Winter Kate Holdridge Jacket in Ivory. My name on facebook is Cristina B. and on twitter is CriLovesJapan. i would wear this winter kate dixie in blue color as the necklace is in the same color and would be the spotlight! I think this outfit is the Best with the necklace because it makes the outfit much more fun to wear and it looks amazing with it as well. I think this outfit looks the best because the beige picks up and compliments the beige jacket. The flesh colored top gives a blank canvas for the green part of the necklace to stand out. When it's worn this way the beauty of the jewelry is highlighted and catches the attention of a person who looks at the outfit overall. I would wear it with Free People Kitty Kat Cardigan in Grey. I forgot to leave my Twitter and Fb name! "I would team the beautiful necklace with this stunning Jen's Pirate dress. The white will really set off the turquoise so it would be the 1st thing you see! i'd pair it with the winter kate devi dress in dark vanilla <3 yum and some boots ;) maybe even a floppy hat! I would style the necklace with "Jen's Pirate Booty Spotlight Kaftan in White"
I would pair the House of Harlow Gold Triangle Turquoise Necklace with the Winter Kate Harlequin Halter Maxi Dress in Green Floral. I just think the colours in the necklace would set off the colours in the dress and it would look great together. I would wear the necklace with this maxi by Jen's Pirate Booty! I would match it with this dress...!!! Perfect for that lunch with friends..!!!! http://www.shopthetrendboutique.com/jepibofrbaun.html. Facebook name is 'Kim RADECKI' Twitter name Decky-2008. I don't know why it got deleted the first time so ill try again. I think this outfit would be smashing with the necklace. Personally i think this outfit would be best because the necklace would make the outfit less boring looking and it'll be fun to wear. i'd wear it over the Winter Kate Dixie in Blue and with the House of Harlow 1960 Brigit Flats in Black! I like the Winter Kate Harlequin Halter Maxi Dress in Green Floral with the necklace! The perfect item of clothing that I would wear with the House Of Harlow 1960 triangle necklace is the "Winter Kate Opy Jacket in Dark Vanilla" cause the Vanilla refere to the white of the nacklace and it's simple et pretty! I would pari the necklace with the Winter Kate Amber Jack Dress in Multi (http://www.shopthetrendboutique.com/wikaamjadrin.html)- a perfect outfit for the upcoming summer of 2011 :) WK and HoH go great together!! I would say the Winter Kate Condor Bed Jacket in Mint goes perfect because the necklace really compliments the look and makes it stand out . I would pair this with Jen's Pirate Booty Angel Winged Kaftan in Military. i like the trend boutique on fb, name cristina v.
i follow nicole richie news on twitter, name mumzymum. i would pair this pendant with Jen's Pirate Booty Day Dream Dress in Cool Peach: http://www.shopthetrendboutique.com/jepibodaydrd.html. I choose The Winter Kate Camellia Dress in Sage because is adjustable ties at its 'V' neck front give the feminine touch. So HOH1960 triangle necklace it's perfect because add a splash of color to muted fall dress. I would pair the necklace with the Winter Kate Kimono Dress in Grey Floral. The necklace would make it pop perfectly. I would put the House Of Harlow 1960 Triangle Pendant Necklace with WK Feather Meadow Cami in Ivory and/or with WK Damien Dress in Ivory. I think the Gypsy 05 Amber Maxi Dress in Acid Black would pair perfectly with this necklace! 1. LIKE The Trend Boutique on Facebook as Monika Lintang Retnani. 2. FOLLOW @NRichieNews on Twitter as @monikaretnani and tweet here. 3. I would pair it with Lauren Conrad Cindy Skirt in Brush Strokes. I would pair the necklace with 'Jen's Pirate Booty Bowie Blouse in Natural'. I think the boho blouse looks extremely comfortable to wear, yet stylish and the triangle necklace would spice it up a bit, sharpen the look. I also chose the natural one instead of the white one, because I think the natural will go better with the gold colored necklace than white. Keeps it a little more boho and a little more calm. I would pair the HOUSE OF HARLOW 1960 triangle necklace with the Blue Life Angel Top in White. The necklace would be eye-catching against a plain white top! Nicole is the perfection ! I would wear the House of Harlow pendant necklace with this cutting-edge vest. Not only is it chic, but extremely *edgy and since the vest is black, the necklace would stand out immediately. The piece from the trend boutique which I wouls pair with the House Of Harlow 1960 necklace is the Winter Kate racer tank in Mint Ivory, both brands have the same ethos behind them, so compliment each other well, and as this necklace is bold I think it goes well with an understated neutral top, and this pastel shade is gorg! Hi! I would wear the necklace with the Black Halo Caitlyn Dress in Black. I think this necklace would make a huge statement on the dress and that's what I like about HOH jewelry. I would pair the necklace with Jen's Pirate Booty Free Spirit Poncho in Haze Gray Tie Dye.